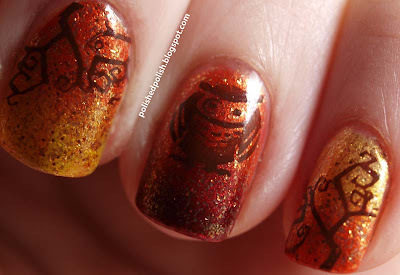 It's Sunday again which means another challenge in Adventures in Stamping. This week's challenge is Can't Wait for Fall. Originally I wanted to do leaves, but then I figured most people would do leaves. So to mix it up a little I went with the Bundle Monster combo of owl and vines from the pumpkin image over some glittered gradients. This was definitely some trial and error and a week of thinking, but it was so worth it because I love the way it turned out! I think the owl is so cute. 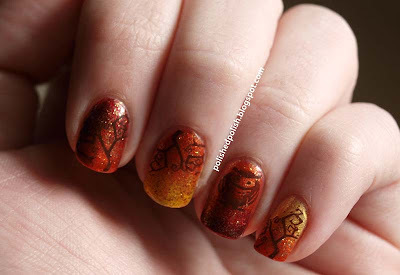 Unfortunately my nails are too small to make use of the full nail plate featuring the owls. Thanks! I've been dying for fall so I could use that orange.